These top loading dispensers are the perfect size for standard glove boxes. 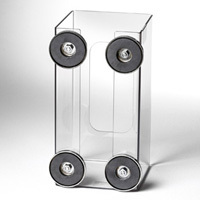 They can be table or wall mounted, horizontally or vertically. Units that hold 1, 2, 3, or 4 boxes are available in white, heavy-duty plastic or ECO FRIENDLY 100%recycled PETG, clear plastic. * Easy access models that allow you to change one box without affecting the others are also available, see item # 06021. The 1-box dispenser measures 9.5" H x 5.5" W x 4.0" D.
The 2-box dispenser measures 10.0" H x 11.0" W x 4.0" D.
The 3-box dispenser measures 15.25" H x 11.0" W x 4.12" D.
*1: California Proposition 65: This product contains a chemical know to the State of California to cause birth defects or other reproductive harm. *2:California Proposition: This product contains a chemical known to the State of California to cause cancer.